And oh when I saw her, darkness fled from me and flew like a blackbird into the sun. The elite ska veterans that comprise Streetlight Manifesto reconvened in 2007 to create one of the most celebrated ska albums of that year. This Victory Records mainstay has been burning up the genre for years, but its latest roster of talented musicians is filling out the name in a whole new way. Lead vocalist and guitarist Tomas Kalnoky has assembled a skilled party of horns, percussion and guitars with an unrelenting tempo and toe-tapping urgency. Along with founding member and sax dynamo Jim Conti, this fluid integration of ska, punk and reggae comes to a peak on the band’s latest installment, Somewhere In The Between. This intricate blending of styles and sounds was first fashioned in 2002, but it certainly was not the first time these six members had seen the spotlight. The “all-star league” that Streetlight Manifesto became was comprised of the talents of two of the biggest New Jersey ska veterans of the ‘90s, Catch 22 and One Cool Guy. This half-and-half combo of friends immediately began to cut a four-song demo/EP, meshing their gifts into a familiar but adventurous sound. 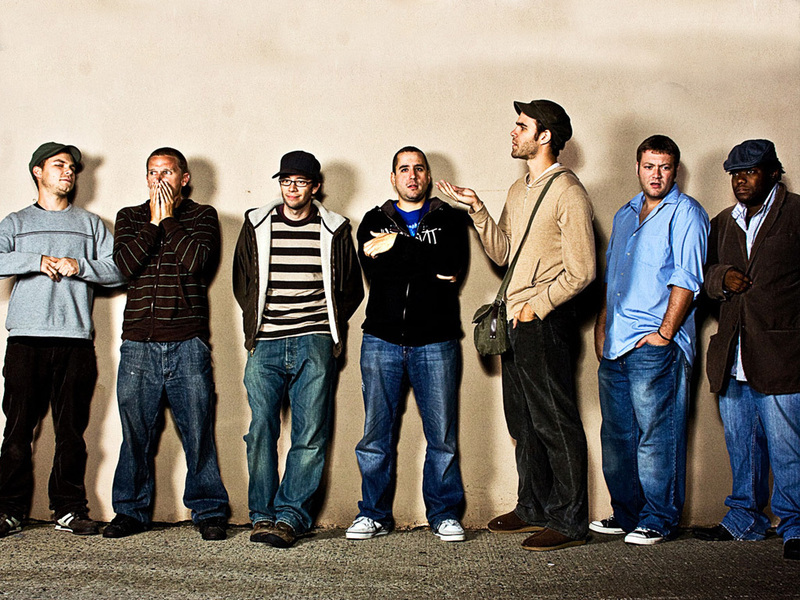 The disc was sent to specific independent labels, and soon Streetlight Manifesto was a member of the Victory Records family, just as Catch 22 was. After its first record, the critically acclaimed Everything Goes Numb, Streetlight Manifesto began unfolding a revolving door of musicians. The lineup that recorded the album adjusted before it began live shows, and the outfit has continued to morph its roster since. Several new musicians could be found on the band’s following album, a re-imagining of the Catch 22 debut Keasbey Nights. The current arrangement of masters of sound includes drummer Christopher Thatcher, Peter McCullough on bass, Mike Soprano on trombone, Michael Brown on baritone sax and trumpeter Matthew Stewart. The band eluded the idea of an early 2007 release date to take its time and create the most infectious sounds these crafty musicians could provide for its third album. Somewhere In The Between is the epitome of what defines Streetlight Manifesto. Jubilant horns and an irresistible swing are just part of the charm of this album, which barrels into one exuberant song after the other with catchy rhythms, clever lyrics and sheer musicianship. Their 2007 release proves that Kalnoky and Co. can stick to the roots that have amassed a legion of die-hard ska fanatics while breathing new life into the genre. With the wait finally over, Streetlight fans were rewarded with the album The Hands That Thieve on April 30th. It's the same horn-driven, catchy ska brilliance you’ve grown to love from Streetlight Manifesto over the years, with some new, fresh elements along the way.